Did you notice that we don’t stop recommending to drink more water on each weight loss and fitness article? It is not to fill up spaces or to sound like a broken record, but water is very important for the health, since our bodies are made up of 70 percent water, you need to guzzle it enough in order to keep your system functioning properly. Unfortunately some people don’t drink enough water, not because they are trapped in the desert or living in a third-world country, but because they prefer quenching their thirst with beverages like soda, fruit juices, kool-aid, coffee. Basically you can get some hydration from these liquids, but unlike water these beverages can have an impact on your health, plain water is necessary and here’s what happens to your body when you don’t drink enough water. 1- You Gain Water Weight. 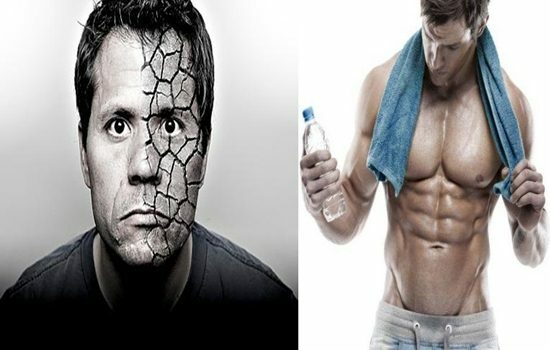 It is counterintuitive, when you don’t drink enough water, your body retains every single drop of liquid in its cells to prevent sever dehydration, so you will gain temporary weight. If you are lacking energy, skip on Caffeine and drink water instead, when your body is experiencing even a slight dehydration your energy levels drop significantly, it is water that gets your metabolism rates high which is responsible for your energy so drink at least eight Glasses of water daily. 3- Your Risk Of A Stroke Increases. Not drinking enough plain water don’t only make recovering from a stroke harder but can also make the stroke worse and more sever according to a recent study, if you are not a fan of plain water then opt to add a squeeze of lemon or a tablespoon of honey to your water. Feeling angry? Maybe not drinking enough water is the reason why, according to two studies made by the University of Connecticut where they put participants from both genders through a series of cognitive tests, and found that even slight dehydration affect their moods and caused headaches and fatigue. Get rid of gray hair with this amazing homemade drink!